Carrot fly is the most problematic pest of carrots and allied vegetables. It can make a large proportion of the crop inedible. Symptoms - Rusty brown scars ring the tap roots of carrot and other susceptible vegetables, making them inedible, and susceptible to secondary rots. When the roots are cut through, tunnels are revealed, often inhabited by slender creamy-yellow maggots up to 9mm (3/8in) long. There is no definitive solution, many ideas work for some and not others. Physical barriers work well, as does high planting and fly resistant varieties. Timing is important. Carrot fly eggs hatch about a week after laying and the larvae mature into adults after about three months. The female lays her first eggs in April or May, when the cow parsley (a member of the carrot family) is in flower. This first generation lays its eggs in July or August, and these hatch into a second generation. The larvae of this second generation often over-winter in the roots. So one course of action is to sow in between the two generations, i.e. in late May or early June, and harvest as soon as the carrots are ready rather than leave them in the ground. Non-chemical controls - Sow sparsely to avoid thinning the seedlings. Female carrot flies searching for egg-laying opportunities are attracted by the smell released when surplus plants are removed Late sown carrots (after mid-May) avoid the first generation of this pest; similarly carrots harvested before late August avoid the second generation Protect vulnerable crops by surrounding them with 60cm (2ft) high barriers made of clear polythene to exclude the low-flying female flies, or cover the plants with insect-proof netting, such as Enviromesh. It is essential to practise crop rotation with these methods, otherwise adult carrot flies may emerge within the protected crop from overwintered pupae in the soil Choose carrot cultivars that are less susceptible to carrot fly, such as 'Fly Away', 'Maestro', 'Resistafly' and 'Sytan'. These cultivars are less susceptible to carrot fly, rather than being fully resistant A mixture of pathogenic nematodes, sold as 'Nemasys Grow Your Own', can be watered into the soil to control the young larvae. This is available by mail order from biological control suppliers. Carrot fly tends to lay its eggs in the late afternoon or after rain so beware of these critical times. Poly-Tunnels - a sure fire way to keep carrot fly at bay. There are now suppliers of small (for domestic/school garden use) to large commercial tunnels. These give total control of all the environmental conditions and can also extend the growing season. For more information contact Firsttunnels uk, the leading UK supplier here. The carrot fly, Psila rosae is a serious and widespread pest and is really the only pest worth worrying about. The damage is done by the grubs tunnelling into carrot roots, disfiguring them and allowing moulds to gain a hold. How do you know you have a Carrot Fly attack? Basically you will not know until you lift the crop. In severe infestations the first sign is that the Carrot leaves look an orange, reddish, rusty colour. They then turn yellow. On lifting an affected Carrot it will be seen that the root end will be black or dark. Close examination of what appear to be good Carrots may reveal small holes in the Carrot. If Carrots are put in a bucket of water badly affected ones will come to the surface. This however does not mean that those which do not float are totally unaffected. Covering the crop with Enviromesh or similar is the best method of fly control. The carrot fly locates its carrots by scent. Crushing the foliage may make them easier to find so leave them alone! If you must weed the carrots, do it on a dry evening with no wind, as the scent of the bruised foliage will not spread so far, and carrot flies take wing in bright sunli ght. Pull carrots for eating in the evenings too, for the same reason. You will often see the suggestion that growing onions in between the carrots keeps the carrot fly at bay. The idea is that the onion smell fools the female fly, which is otherwise attracted by the lingering foliage scent after carrot thinning. Alas this lovely romantic idea rarely works in practice. Onions can only be effective when the onions are in active leaf growth. Best results come from four rows of onions for every one of carrots and the beneficial effects will diminish as the onions start to bulb. Other strongly scented plants such as French or African marigolds, pennyroyal and garlic have all been suggested in the past, but have insufficient data to back up their claims. Mix carrot seed in with a packet of mixed annuals and sow as usual. A mixed crop should sustain less damage than a monocrop. You can also emulate commercial organic growers method of timing your sowings to miss the egg laying season. This means sowing in February or early March, or waiting until Mid June. Carrot Fly are low fliers! - one simple method for a home grower is grow in pots and put them on a table. The fly whizz past at no more than 18 inches above ground level. Adults have a wingspan of 12mm and the larvae (8-10mm) feed on carrot roots, making holes that often become infected with other rots and moulds, resulting in carrots no-one wants to buy. carrot flies aren’t strong fliers though, so by growing susceptible crops in a windy area life can be made very difficult for them. Mulching with grass cuttings can make it harder for the female flies to find a suitable egg laying site. The crop appears to benefit from the extra support given by the earth and you'll have noticeably fewer carrots with green shoulders. The mulch enables the carrots to make better use of nutrients and water in the soil, encouraging healthy growing conditions and improving their ability to resist attack. It also makes it more difficult for the female flies to lay their eggs in cracks in the soil. A range of creatures will make their home under the mulch, some of which will be predators of the carrot fly such as ground beetles and centipedes. Watch out for slugs and snails who will also thrive in these conditions! Location can be vital. However unappealing to the gardener, a windswept site with little protection is ideal. Carrot fly adults are weak fliers and tends to lurk round field edges or garden margins. A couple of varieties offer some resistance to the problem these are "Fly Away" and "Sytan". If the problem is serious in your area these will probably be attacked with the rest. Best results are obtained if no other variety is grown alongside. Autumn King types are carrot fly's favourites, so avoid sowing these if there is a known problem. Some seed companies suggest a "sacrificial strip" in that you should grow Flyaway or Resistafly alongside non resistant varieties such as early Nantes. This will allow any carrot fly in the area to attack the non resistant row, otherwise a minor attack can still occur. You can also try to reduce this pest by placing a sprig of wormwood around the plants crown. This masks the scent of carrots and the flies should leave them alone. Other plants to try include black salsify (oyster plant), coriander, lettuce, onion family, pennyroyal, rosemary and sage. Whilst carrots are their ultimate favourite food, the carrot fly is partial to munching on other plants in the same ‘Umbelliferae’ group that carrots belong to. That includes such common plants as cow parsley, for example. These can be grown in the hedgerows around the carrot fields and the carrot flies can overwinter in these plants quite happily until their favourite carrots are planted again the next year. IT is therefore important to rotate crops to a very careful schedule to helps keep the naturally-occurring population low. When it comes to reproduction, the carrot fly is no lazy performer. There are at least two generations per year – sometimes there are three. The first eggs hatch with the onset of warmer weather in May and June. Sow their carrots in May before any eggs hatch, then cover them with re-usable fleece as a barrier against the carrot fly entry. By the time the little plants emerge 4 weeks later, the majority of the first generation of carrot flies has hatched and moved safely onto other host plants in the hedgerows, having been fooled into thinking no delicious carrots lay beneath them. For the second generation of flies emerging in August, new weapons are required. So organic growers place sticky yellow traps (insects are attracted to the colour yellow) in the crops. Each week the number of flies trapped is counted to monitor populations. Once fly numbers are at a peak, it’s time to get out the garlic! This is because this is the time when egg-laying is happening and flies hate the smell of garlic. Garlic granules are applied to the growing crop straight away from July to the end of August, every week. Some people grow onions alongside carrots for the same reason – it masks the smell of bruised carrot foliage that attracts the flies. It is vital to take every last carrot out of the field at harvest time. A single carrot left in the ground then provides a holiday home for carrot flies over the winter so it's important to do everything you can to make this environment inhospitable for pests as part of organic methods. It sounds complicated, but it’s great to use such natural methods to grow a strong healthy crop, and there’s a great satisfaction when you know you’ve outsmarted your pest opponents! How do I detect Carrot Fly? Basically you will not know until you lift the crop. In severe infestations the first sign is that the Carrot leaves look an orange / reddish / rusty colour. They then turn yellow. On lifting an affected Carrot it will be seen that the root end will be dark or black. Close examination of what appear to be good Carrots may reveal small holes in the Carrot. If Carrots are put in a bucket of water, badly affected ones will come to the surface. This however, does not mean, that those which do not float are totally unaffected. An adult carrot (or "rust") fly is a very small black fly which has been described as "a low flying miniature cruise missile". The fly is attracted to the Carrots by smell. It lays its eggs in the soil adjacent to the Carrots. The eggs hatch and the grubs burrow into the roots. The result is a mess, with grub tunnels all through the carrot. It stays in the ground over winter gorging itself on your Carrots, pupates and lays eggs in early spring. Eggs will ideally be laid near to Carrots but Parsley, (and Cow Parsley), Celery and Parsnips, are also affected. After the spring generation have hatched they lay eggs in June and July and this generation hatches and matures in enough time to have another frenzy of egg laying August / September time. This insect pest also loves parsley, parsnips, celery and celeriac. Attacks are particularly bad in old established gardens where the population builds up each year. Most carrot pests and diseases are soil-borne and can be controlled by crop rotation. Adult flies, attracted by the smell of carrots, lay their eggs at ground level so the little white grubs can hatch out and tunnel into the carrot roots. Therefore vulnerable young seedlings die and the foliage of large seedlings turn bronzy red and the plants weaken. There are usually two, sometimes three, generations of carrot fly in a year. The first and worst attack occurs mid-May and mid-June; subsequent attacks are in Autumn and in Winter in mild seasons. The Carrot Fly is low flying and therefore can be prevented from laying its eggs by physical barriers such as polythene. Surround the carrots with a 60cm high barrier of clear polythene film or fine netting nailed to canes, making sure there are no gaps at ground level. These barriers should be no more than 100cm wide. In dry months water the carrots if they appear to get dry because of the barrier. The later generation feeds on carrot roots left in the soil in Autumn and early Winter. Grubs pupate in the soil, and hatch out as the first generation next Spring. Other practical tips include sowing early carrots before mid-March and main crop towards the end of May or mid-June. Sow very thinly to minimise the need for later thinning. You can try growing carrots under fine net film, very similar to mosquito netting, making sure there are no gaps at ground level. Inter-planting onions or garlic in the carrot beds may also ward off the villainous flies. Mix carrot seed with feathery leaved annual flowers when sowing. Compost and wood ashes will also scare off not only carrot flies but carrot weevils, wireworms, and other carrot pests. Probably the best organic way to get rid of pests is to soak the bed once a week with a thin mixture of wood ashes and water using a watering can. Some chemical control can be achieved through dusting the rows before sowing in Spring with bromophos, phroxim or pirimphos-methyl dust. Protection of late crops can be done by spraying with half strength liquid pirimphos-methyl in early August. Grow varieties with partial resistance. "Fly away" and "Sytan" have some resistance and the old fashioned mainly white fodder carrot is also fairly resistant. It is commonly said that as climate change progresses, agricultural pests thrive, expanding their range or producing more offspring per year. The opposite is true of the carrot fly: in years with hot summers, it occurs in a lower population density than usual - as studies by Agroscope in German-speaking Switzerland have shown. According to the Intergovernmental Panel on Climate Change (IPCC), temperature rise in the course of the 21st century is considered inevitable. In agriculture, this could promote mass propagation of insects. However, a major agricultural pest reacts the other way around: the carrot fly (Psila rosae). 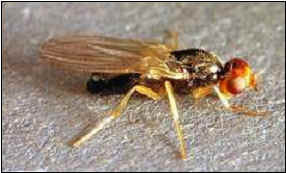 It is one of the vegetable flies and is an important pest in carrot cultivation in Northern and Central Europe. It is monitored in Switzerland by default with traps, which makes their activity visible. From a critical catch number onwards (the so-called damage threshold) damage to crops is to be expected, which is why an insecticide treatment is recommended according to the principle of Integrated Pest Management. As the data from the traps shows, the carrot fly in German-speaking Switzerland developed three complete generations in years with very wet summers (2007, 2014). In contrast, in many locations the third carrot fly generation after summers with pronounced heat spells was extremely small - as happened in 2006, 2013, 2015 and 2017. In those years, ground temperatures at a depth of 10 cm were over 23° C for several weeks in June or July, which increased the mortality of larvae and pupae of the carrot fly or led to a temporary development stop of the pupae. Even with the second generation of carrot flies, a flight delay was increasingly noticeable. The carrot fly is therefore sensitive to dryness and heat. Therefore, climate change in German-speaking Switzerland could favor the occurrence of development breaks and possibly reduce the number of generations per year. For food security in times of climate change, trap monitoring, field controls and forecasting systems are becoming increasingly important. This is the only way to react in time to the changed appearance of pests or to new immigrant insects.